Mrs. Amy Blackmond has taught Computer Science at Oakland Catholic for two years, utilizing her impressive educational background and industry experience. After graduating from the University of Pittsburgh with a B.S. in electrical engineering, she worked as a hardware design engineer as well as an engineering consultant. 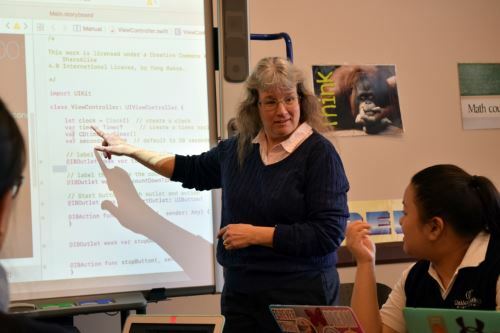 At OC, Mrs. Blackmond currently teaches AP Computer Science, Computer Programming, Programming Mobile Devices, and Intro to Programing in Scratch. She has also taught Electronics, Math, and Robotics in the Pittsburgh Public Schools, at Computer Tech (IADT), and at a CCAC summer camp. Mrs. Blackmond is excited to share her expertise with all her students! Mrs. Cathy Fratto has been teaching U.S. History and World History at Oakland Catholic for the past twelve years. Throughout her time at OCHS, she has been awarded several prestigious National Endowment for the Humanities (NEH) teacher workshop grants and has been involved in numerous curriculum development initiatives for the classroom. Mrs. Fratto really enjoys integrating writing instruction into her history courses, particularly with her AP U.S. History class. She is excited to return to BAM! again this summer with new activities and fresh ideas that will enhance the writing workshops. With a bachelor's degree in physics and a master's in secondary education, Mr. Steve Graner brings a wealth of knowledge and passion for teaching physics to his classes at Oakland Catholic. Mr. Graner currently serves as the Science Department Chair and teaches College in High School Physics, Honors Physics II, and Engineering Design. He engages his students in the field by integrating real world applications and hands-on labs into his lessons as often as possible. This summer he will be teaching AERO Lab, allowing campers to simulate flight both within and outside of the classroom. Ms. Amanda Skoner graduated from OCHS in 2008 and returned as a valuable asset of the faculty a few years ago. After graduating, she received a bachelor's degree in chemistry from Juanita College, then spent two years teaching chemistry in central Pennsylvania. Since then, she has been welcomed back to the OC community and taught both College in High School Chemistry and Honors Chemistry I, in addition to serving as the advisor for the Environmental Club. Just recently, Ms. Skoner earned her master's in education from the University of Pittsburgh. 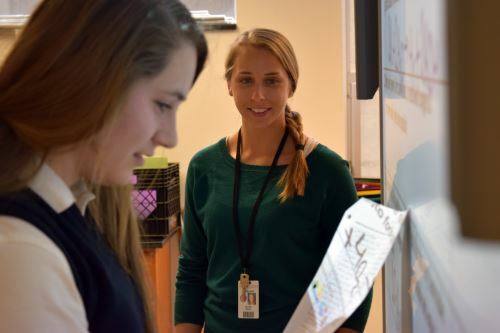 Ms. Skoner stands out as an excellent teacher and challenges her students on a daily basis. She can’t wait to share her lab with you!